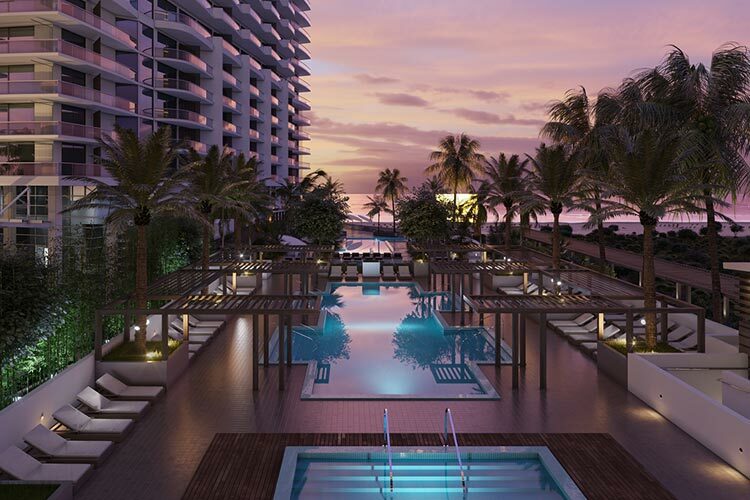 Spanning over seven acres on a pristine stretch of the Atlantic shoreline on Palm Beach County’s picturesque Singer Island, Amrit Ocean Resort & Residences is being developed in partnership with world-renowned ESPA Spas and the Himalayan Institute. Amrit will be one of the most wellness-immersive developments currently under construction in the United States. Sales are set to begin in the fall, with completed construction and delivery scheduled for spring/summer 2019. The property will be comprised of two towers, each offering indoor and outdoor living, with modern cabinetry, state-of-the-art appliances, designer fixtures, and large sliding glass doors that open to covered terraces with spectacular water views. Tower P (Peace) will be a resort residential tower, which can offer features such as posture-supportive heat reflexology floors, personalized digital entertainment packages, mood-enhancing aromatherapy, vitamin C-infused showers, exterior sound intrusion block, and dawn simulation to gently increase the amount of light in the bedroom at a customizable wake-up time. Tower H (Happiness) will offer a hotel-residential mix featuring a large array of amenities. Amenities: Access to a 100,000-square-foot indoor and outdoor spa and wellness amenities, oceanfront restaurant with regional and international specialties, meditation garden, indoor and outdoor yoga studios, whirlpool spa, a private beach club with cabanas, watersports and complimentary lounge chairs, umbrellas, and towels. Both towers will feature recreational pools for residents.